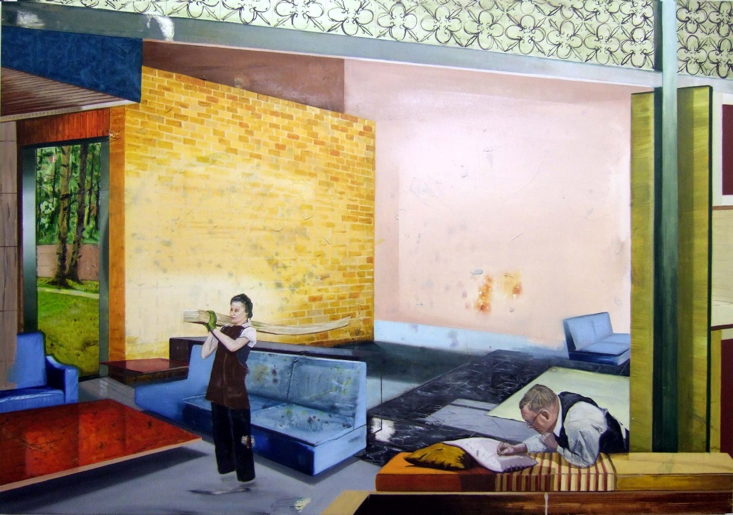 Ian Hartshorne is Head of Painting at Manchester School of Art. Ian trained for his M.A at Chelsea College of Art and was a Stanley Picker fellow at Kingston University and a subsequent Boise Scholar at The Slade. He has just completed a practice based PhD which investigates the affect upon painting within the digital realm. He has exhibited extensively across U.S.A and Europe and is represented by Galerie Andreas Binder, Munich. He was a founder member of ‘Teaching Painting’ an organisation, a coalition of educators, which explores the relationship between teaching and painting through hosting conferences, publications, exhibitions and workshops. Currently Ian is curating an exhibition cycle called ‘Fully Awake’ which over the next 2 years will bring together 60 institutions and 180 artists in an intergenerational cycle of shows that will visit 5 U.K cities. He is also co-editor of Teaching Painting: How Can Painting be Taught in British art schools? Published by Black Dog 2017.